Astronauts of the HERA 10 crew began their mission on May 2nd. The "splashdown" on June 1, ending their 30 day analog mission aboard the HERA simulated spacecraft. After 30-days in the confines of a simulated spacecraft, the HERA Mission 10 crew will "splashdown" on the evening of Wed., June 1. HERA-the Human Exploration Research Analog-is one of several analogs used by the Human Research Program (HRP) to research ways to help NASA astronauts move from lower-Earth orbit to deep space explorations. A spaceflight analog is a situation on Earth that produces physical and mental effects on the body similar to those experienced in space. During the tenth HERA mission, crew members went through all the motions of a real deep space mission without ever actually leaving JSC's building 220. 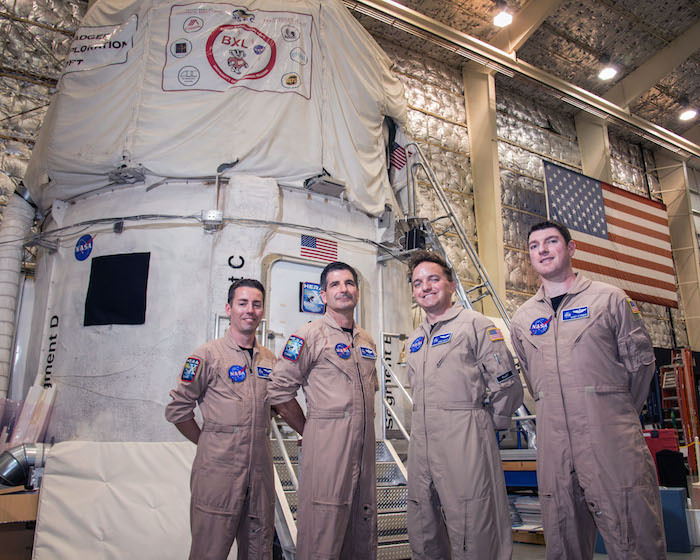 The four "astronauts," selected from JSC's Test Subject Screening (TSS) pool, are Chris Matty of Houston; Ron Franco of Lockport, New York; Casey Stedman of Olympia, Washington; and Oscar Mathews of Virginia Beach, Virginia. After splashdown, the crew will remain onsite at JSC for debriefing for approximately one-week. The HERA 10 crew tested hardware prototypes before they are to be used in off-Earth missions. They conducted experiments involving plants, brine shrimp, and created a piece of equipment with a 3-D printer. They visited a virtual asteroid and simulated the processing of soil and rocks collected. Researchers outside of the spacecraft collected data regarding team dynamics, conflict resolution and the effects of extended isolation and confinement. "Based on real-time observations and reports from the MCC (Mission Control Center) during the mission, the crew successfully accomplished many of the planned scientific objectives," Andy Self, Flight Analog Project operations lead, said. "This should result in high quality data sets for the investigators." Lisa Spence, the Human Research Program's Flight Analogs project manager, is pleased with the progress of the crew. They "performed exceptionally well as an EVA (Extravehicular Activity) team," she said. "They collected asteroid samples during the rendezvous phase of the simulation and accomplished the mission objectives they were trained for." How real is a HERA mission? "When we set up an analog research investigation, we try to mimic as many of the spaceflight conditions as we can," Self said. "Obviously, we are not in microgravity, but we can mimic confinement and the stress that goes along with it." HRP will conduct two additional 30-day HERA missions in calendar year 2016. The TSS group is currently recruiting healthy, non-smoking volunteers ages 30 to 55 for these missions. Volunteers will be compensated and must pass a physical and psychological assessment to qualify.